A couple months ago, I got an email from a company offering me a taste of their product--a "depression-era hooch" called Spodee. Also known as "Wine with a Kick." Now I get a LOT of these emails, and usually I ignore them or let the person know that it's not really a good fit for my writing, but this time, I was totally intrigued. Spodee, the woman explained, was an old fashioned beverage made from a combination of homemade wine, spices, and moonshine. It had been popular during the depression era because it was cheap and strong, and a company based in Pennsylvania decided to bring it back as a nod to the current economy. And, the woman added, it comes in an "old timey milk bottle." If you know anything about me, you know the phrase "old timey" gets me. I agreed to try it and waited for my milk bottle of hooch to arrive. As promised, the jar arrived--an old fashioned milk bottle filed with dark red wine. The tag offered a drink suggestion ("Spodee and Sody"), but I decided to try it straight. And I did. ON CAMERA! You can watch my YouTube taste test video HERE. Basically, it's good stuff. Not good wine, but a tasty drink. It's sweet, but not overwhelmingly cloying, with slightly spicy, chocolate notes. I wouldn't drink it on it's own, but think it would be an awesome mulled wine or sangria. But what I really wanted to do was cook with it. I kept the bottle in my fridge until last week when I was hosting friends for dinner and decided to use it as part of a quick appetizer. 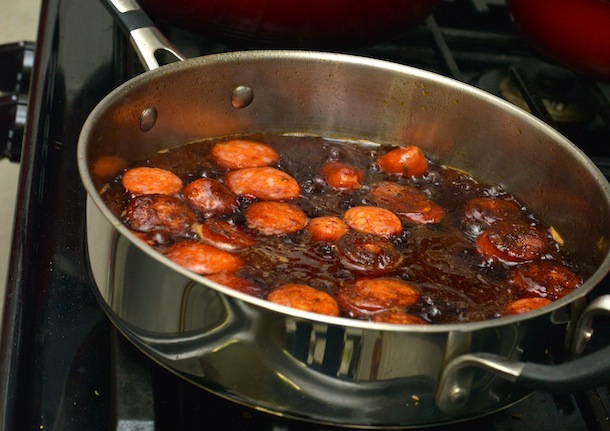 I fried slices of spicy chorizo and then poured the Spodee on top, letting it reduce into a boozy, syrupy caramel. This is a riff of another dish I make using regular wine with the addition of sugar, but since the Spodee already has a high sugar content, as well as great flavor from the spices, I just needed two ingredients--super easy! I placed it in a bowl with a few toothpicks and stood back and watched as my friends proceeded to flip out over the deliciousness. They went wild over the combination of spicy salty chorizo and the deep sweet wine caramel syrup. It was gone in minutes (we were barely able to capture photos) and soon everyone was asking about the Spodee. The appetizer ended up being such a hit (and SO EASY! ), that I doubled the recipe and made it again for Thanksgiving at my in-law's house. Once again, it was gone in minutes. Spodee is a pretty new product, so it's currently only available for sale in Pennsylvania and New Jersey, but you can also buy it online here. Thanks to the lovely and super talented Monica Navarro for taking the gorgeous photos in this post! Heat a large skillet over medium heat and add the sliced chorizo, letting them fry in their own fat until crisp on each side (about 2 minutes). Once the chorizo are fried, pour in the Spodee and use a wooden spoon to scrape up any bits stuck to the pan. 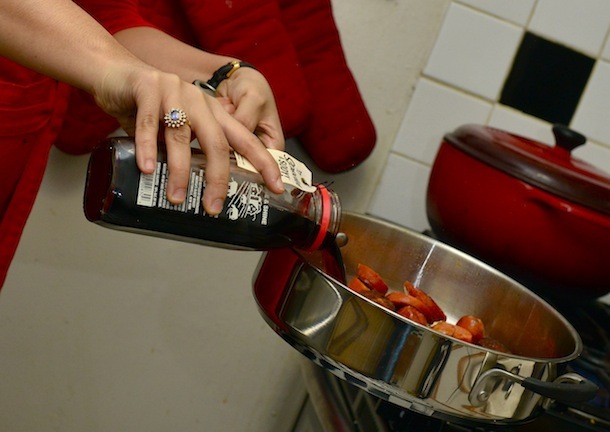 Lower the heat and let simmer about 5-7 minutes, or until the sauce reduces into a thick syrup. Remove from heat and serve immediately with toothpicks as an appetizer.